*Reflects Aston Martin, Ferrari, McLaren and Lotus sales. New-vehicle sales rose 5.8 per cent in January, largely on the backs of pickups and utility vehicles as automakers delivered 117,785 total vehicles. 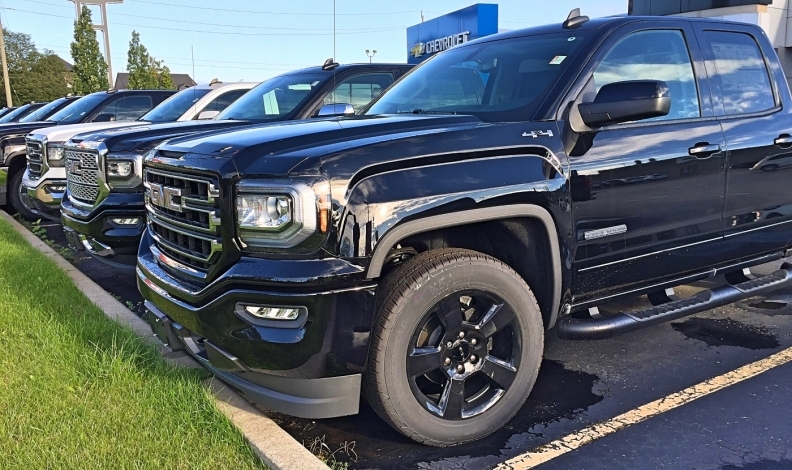 Trucks continued to be a hot seller in the Canadian new-vehicle market in January, leading to overall sales increases at General Motors, Honda and Toyota while moderating a decline at FCA, where the Jeep brand did all the heavy lifting. GM Canada sales increased 15 per cent — with truck sales booming — in January when compared to the same month a year ago. The automaker sold 16,791 vehicles during the month. It was GM Canada’s second-best January on record, the company said. The Chevrolet Colorado, Equinox, Silverado, Suburban, Tahoe and Traverse all saw gains. The same could be said for the GMC Acadia, Canyon and Yukon. The only trucks to see sales dip were the Sierra, down 8.9 per cent, and the Terrain, down 4.9 per cent. Meanwhile, the automaker struggled to sell cars. Sales of every Cadillac car were down, as were sales of the Chevy Malibu, Sonic and Volt. The Chevy Cruze proved to be a bright spot when it came to car sales. GM sold 2,329 units, up 105 per cent over 2017. By brand, Chevy saw the biggest increase, up 25.9 per cent. Honda Canada reported total January sales of 13,105 vehicles, 28.8 per cent higher over last year and a new record for the month. The Honda division alone reported January sales of 12,007 units, up 32 per cent over last year and good for a January record. While the Honda Ridgline pickup struggled -- sales were down 15.5 per cent -- the automaker’s utility vehicles picked up the slack. The Honda HR-V topped a monthly sales record with 862 units sold versus the previous best in 2017, when it sold 850 units. Honda CR-V set a January record of 3,770 units sold versus the previous best in 2017 when it sold 2,851 units. And the Honda Pilot had its best January with 565 sales vs the previous best in 2016 with 506 units sold. Meanwhile, there remains appetite for the Honda Civic, which saw its sales increase 34.1 per cent to 4,467 units. The Accord and Fit also saw sales increases during the month. Even Nissan also saw sales increase due to the popularity of trucks. The automaker posted a 6.3 per cent gain in January, selling a total of 8,836 vehicles. Nissan sold 471 Titan full-size pickups, up 77.1 per cent over the same month last year. And its midsize Frontier pickup posted sales of 370 units, up 124.2 per cent. Meanwhile, the Rogue continued to be Nissan’s most popular vehicle in Canada with sales of 2,381 units while the compact crossover Qashqai had sales of 1,069 units and became the automaker’s second-best selling vehicle in Canada. Infiniti sales rose 16.8 per cent. Toyota Canada posted a slight sales gain in January, up 2.5 per cent to 12,482 vehicles, including the automaker’s Lexus luxury brand. Trucks were Toyota’s big sellers with total truck sales up 7.1 per cent. Tacoma sales were up 24.3 per cent to 1,018 units while Tundra sales rose 20.3 per cent to 711. The RAV4 was Toyota’s most popular vehicle in Canada in January, with sales of 2,758, up 2.4 per cent. But, like many other automakers, Toyota saw car sales shrink. Total sales were down 5.1 per cent. Camry and Yaris posted increases of 9.4 per cent and 35.2 per cent, respectively. But the Avalon and Corolla, in particular, were down. Lexus sales were essentially flat, up just 0.1 per cent. Ford saw its total sales slip 4.4 per cent, including a 12.3 per cent decline in car sales. And while the Ford Escape and Ford Explorer saw sales increases of 19 per cent and 13 per cent, respectively, they two vehicles couldn’t stop total truck sales from being down 3.5 per cent. The automaker’s popular F series saw a decline of 16.4 per cent to 7,775 units, a steep drop for the best-selling truck in Canada for more than 50 years running. On the luxury side, Lincoln sales gained 7.7 per cent. FCA Canada reported sales of 17,761 vehicles, a four per cent decrease compared with sales of 18,443 in January 2017. Jeep remained the automaker’s strongest brand, with sales up 28 per cent. Jeep sold 542 Compasses, which is still basking in a makeover. And Wrangler sales were up 196 per cent to 3,755. Chrysler and Ram brands proved to be the automaker’s undoing in January with sales down 33 and 16 per cent, respectively. Even the automaker’s popular Ram pickup couldn’t save the brand, with sales down 17 per cent to 5,046 units. And with the Chrysler 200 and Town and Country no longer available, the brand’s only success was the Pacific. It sold 522 units, up 152 per cent over last year. Even Dodge sales were down 13 per cent with all but the Caravan — up 37 per cent — posting double-digit decreases by percentage.